Dual channels. Rate and total in same transmitter. DIN Rail mounted, digitally programmable. The Laureate 4-20 mA transmitter for frequency, rate or period accepts two independently scalable input channels from a wide range of pulse sources, such as NPN or PNP proximity switches, contact closures, digital logic, magnetic pickups down to 12 mV, or AC voltages to 250 Vac. Input frequencies can range from 0.005 Hz to 1 MHz. Applications include AC line frequency, RPM or speed from proximity switch inputs, and flow from turbine flow meter inputs. With a Standard Main Board, the transmitter output can be scaled to track frequency in Hz, rate (such as gallons per minute), or period (inverse of frequency). Square root extraction is standard. With an Extended Main Board, the transmitter output can track rate or totalized rate (such as gallons) whether the transducer output is linear, requires square root extraction, or requires custom curve linearization. The latter can be provided by a curvilinear spline fit with up to 180 data points. The transmitter can also count up to a preset total or down from a preset total to zero. Such applications typically make use of optional dual solid state relays, which are available as options. External reset of totals is via a special three-position screw terminal connector. The two input channels A & B can also be combined arithmetically to provide an analog transmitter output that tracks A+B (e.g., sum of two flows), A-B (e.g., difference of two flows), AxB (e.g., horsepower as product of force and RPM), A/B (ratio of two flow), and A/B-1 (draw or relative elongation of material between rollers). Exceptional Accuracy and Stability. Laureate pulse input frequency and rate transmitters determine frequency by taking the inverse of period as measured with a calibrated quartz crystal time base. This results in extremely accurate and stable 6-digit internal readings (±999,999 counts), which are then processed in software. The analog output is generated by an ultra-linear 16-bit (65,536 step) digital-to-analog converter (DAC) for 0.02% output accuracy. The update rate of the transmitter output is a programmed gate time + 30 ms + 0-2 signal periods. For a 60 Hz signal, the update rate would be 20 per second. Such fast update rates are ideal for alarm and control. Laureate frequency meters and transmitters accept line voltages up to 250 Vac and output line frequency to 6-digit accuracy (50.0000 or 60.0000) in a few line cycles. Fast low frequency response is achieved by timing the period and taking its inverse. Laureate frequency meters and transmitters are compatible with all flow meters which generate pulses at a frequency proportional to flow rate. The Extended version can display scaled rate or total for the same input at the push of a button, and alarm from both the rate and total. Extended Laureate frequency meters and transmitters offer A+B, A-B and A/B arithmetic functions. A+B allows two input flows to be summed for total flow, while A-B allows outflow to be subtracted from inflow for net flow. Flow ratios aid in the proper mixing of ingredients. Extended Laureate frequency meters and transmitters can linearize the output turbine flow meters, which tend to be nonlinear on the low end. Linearizing improves the dynamic range and accuracy of turbine flow meters. 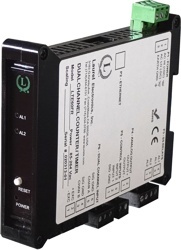 Laureate dual-channel rate meters and transmitters can independently scale, display and alarm two pulse input channels. All signal or alarm data can further be transmitted via RS232 or RS485, including peak readings and arithmetic combinations of the two rates.